The main destinations are Caparu Plateau and Chaplin Lake. 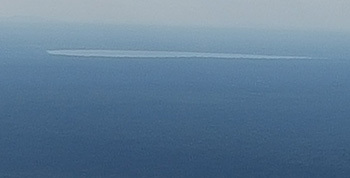 Chaplin Lake is a new destination in the park. The only group turists that got to this place was in August 2015.. The visitors to Noel Kempf Park are really few due to the conditions of access and to the budget needed. Most roads or trails, paths have disappeared in las 5 year or so. It is advisable to make use of the hygienic installations before the commencement of this Noel Kempf tours and boarding the airplane. After a short relaxing at Refugio Huanchaca time we get ready to departure in a vehicle or on horses towards Caparu plateau. The point that we plan to go on a vehicle is about 27 Kilometres away from Refugio Hanchaca lodge. At this point is where the road get into the forest and we should continue on foot. 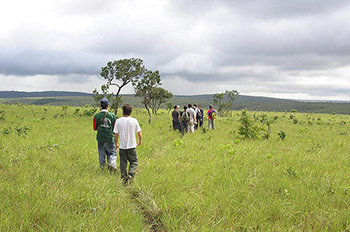 Once start the trip by land leaving Refugio, The first 5 kilometres crosses a part of forest. And then for about 22 kilometres it goes on a land of pampas. The heat in this area is very high and the temperature gets to about 40 centigrade. After breafast we should continue trekking for approximately 2 hours to hike to the bottom of the plateau. During this hike, we need to have our senses alert in order to listen to, smell or see interesting particularities of this jungle. We also need to pay attention to the gradual change from forest of high trees to very low vegetation.The visitors must beware of the thorns and tips of the branches in many sections of the paths within the park. Once we reach the bottom of the plateau, if it is hot or still it is not evening we should not be in this place longer than thirty minutes.The ideal time to arrive at this place known as “Las Lajas” is in the dusk, because during the day and with the presence of people, very annoying bees (especially for the eyes) begin to arrive at the place. 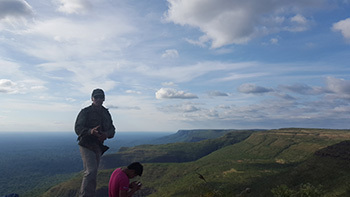 Depending on the time of arrival to Las Lajas and on the conditions that we are, we should continue hikking on a steep trail to the top of Caparu plateau. The ascent to the plateau is a rustic footpath in zigzag, steep and almost without any vegetation to cover us from the sun, which is why the conditions of the ascent can be unfriendly. Especially if there is not enough wind and the sun is strong. In any case, it is necessary to be in good physical condition for this part of the trip. 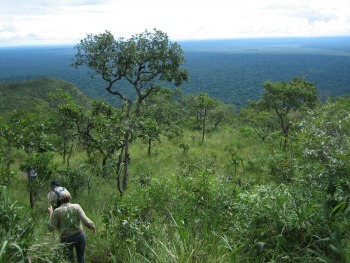 Once on top of the plateau, we will have a hike of about one hour in order to better appreciate the view of the waved green landscape spotted with virgin forest, rivers, streams and palm trees. In this place there greater chances of to see some mammals.From this point, that used to be or still is the camping site on top of the plateau. 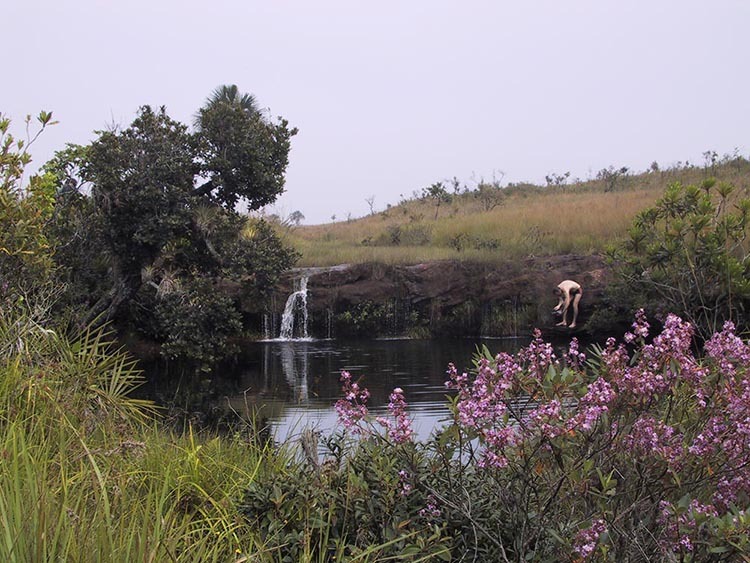 It was possible to do some trekking in the pampas for about 40 minute to a beautiful natural pool. and a short distance away we also can see parts of a small wreckage air plane. Amboró Tours is the only original source of this Itinerary. Amboró Tours also offers longer tours to this destination. 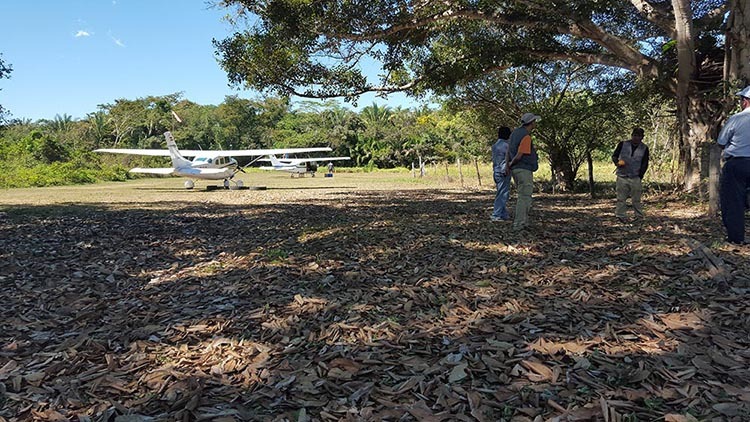 At 08:00 a.m., we will pick you up from your hotel or residence in order to take you to a small airplane runway where we will board a small single-engine airplane, which will fly us to the Southern side of the Noel Kempff Mercado Park. It is advisable to make use of the hygienic installations before boarding the airplane. 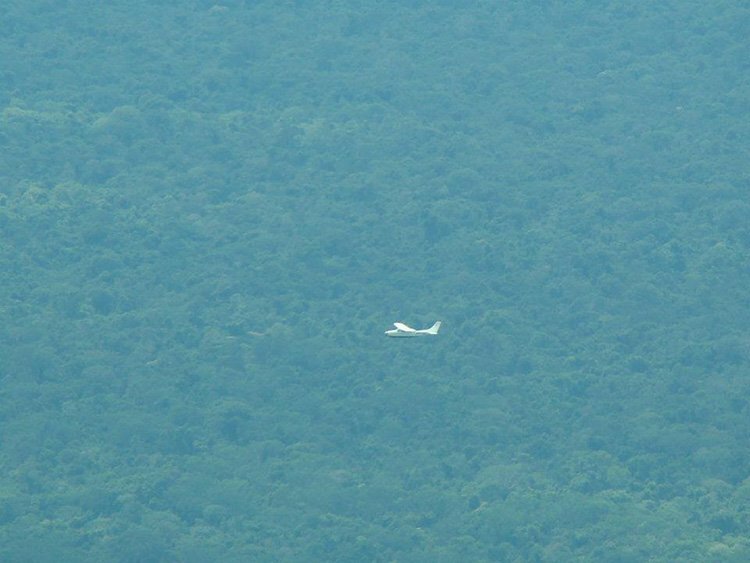 After the first 30 minutes of flight, we will be above the town of Concepción, which is part of the Jesuitical Missions of the Chiquitania. After other 30 minutes of flight, we will notice how the exuberant green mantle becomes denser, and after 60 minutes, we will be above the virgin jungle of the park. Once we are above the park, we will head towards the “El Encanto” (The Enchantment) waterfall, over which we will fly in order to take photographs of it from different angles in order to obtain better pictures; then we will fly at a lower altitude over the prairies of the impressive landscape of the “Meseta” (Plateau) . This is about 7 minutes before landing. 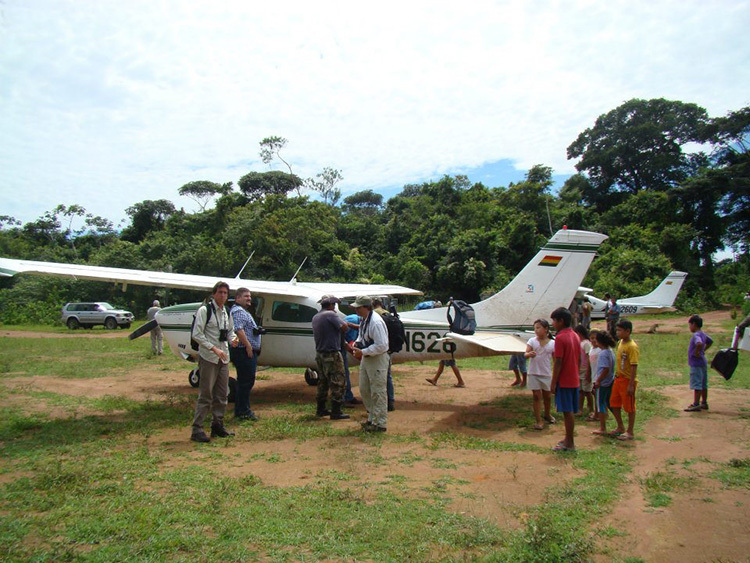 After landing, either in Los Fierros or in Florida, a 4x4 vehicle will be waiting for us by the landing strip, along with the driver and/or the Tour-Coordinator in order to proceed with this excursion. After lunch we will continue this adventure on the ground. If we land in the run way of Los Fierros we will continue on the vehicle directly to El Encanato waterfall or to Caparu plateau. It will depend on the weather and/or other access conditions and also on the available time on that day. If we have had to land in the run way of the community of Florida, then we have to go through the park ranger site to register our names and then we have to cross the Paragua river on a flat boat and drive about 2 hours or more (it depends on the conditions of the path) in order to reach Los Fierros. Florida is a nice village surrounded by the forest and by an oxbow lake of Paragua River. It has nearly 20 families or less because the population is decreasing due to the immigration of the youth people to San Ignacio or to Santa Cruz. From Los Fierros, if we decide to visit the “El Encanto” cascade first, the next campsite is about 35 Kilometers (21.7 Miles) away, it is approximately two hours by vehicle from the “Los Fierros” cabins or run way. 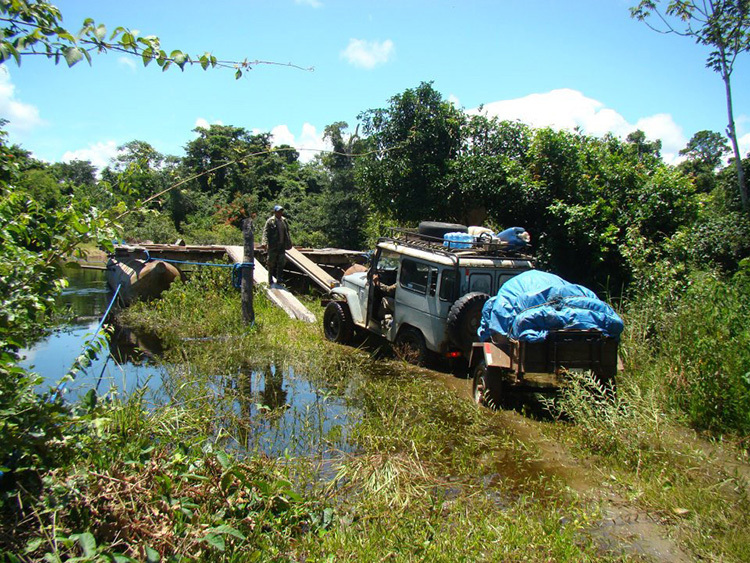 We might be able to arrive with the vehicle to this campsite known as El Encanto Camp, or we might have to walk a few (10) Kilometers in order to arrive at this point. The exact distance we might have to walk is unknown. It is depending on the conditions of the road, bridges and/or fallen trees in the way. Anyways, if the path is in optimum conditions, the vehicle will only be able to arrive at the El Encanto Camp, which is 5 Kilometers (3 Miles) away from the cascade. 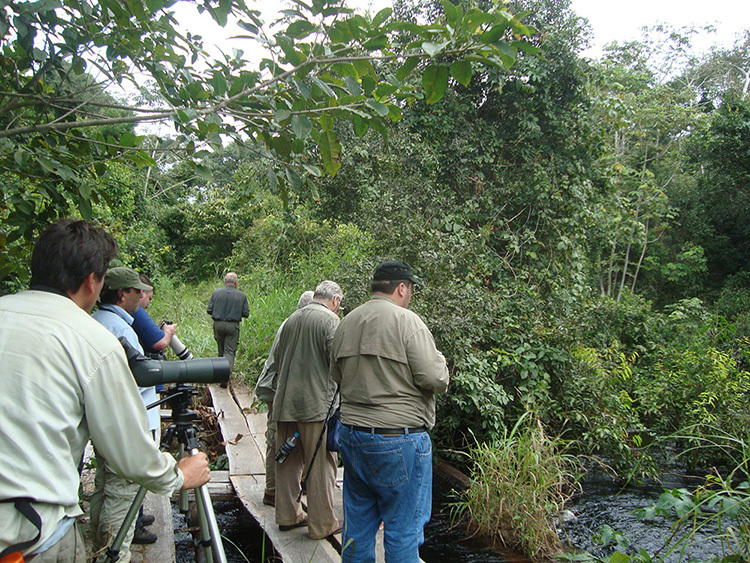 During the trip, either by vehicle or hiking the trails, we must keep our ears in alert in order to listen to the sounds of the forest and have more possibilities of observing the wildlife, like Macaws, monkeys or larger mammals such as the Tapir, and if we are very lucky we may even see a Jaguar. 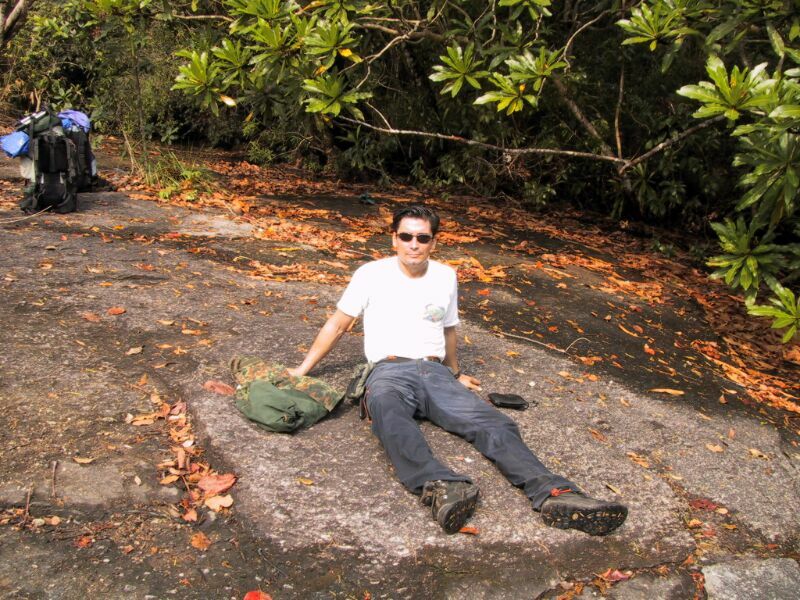 Once we are in El Encanto Camp, we can continue our walk to the waterfall on this first day, or we may have to do this on the next day, this will depend on the available time for this part of the excursion. We will spend the night at the El Encanto Camp or at Los Fierros, depending on the road and bridges conditions as said before. Wherever we have slept the night before, we will arise very early in the morning to have breakfast. 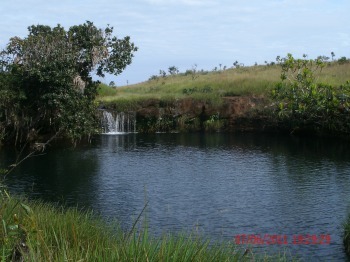 If we had already visited the cascade on the previous day, we will head directly to the “Caparú” plateau. Again the vehicle will go as far as possible, and this depends one more time on the conditions of the bridges and the trees fallen in the way, although it is usually possible to drive until the end of the vehicle´s road, and in this case we will only walk for two hours until the base of the plateau. During this hike, we must keep our senses in alert to be able to hear, smell or see the interesting particularities of this place. 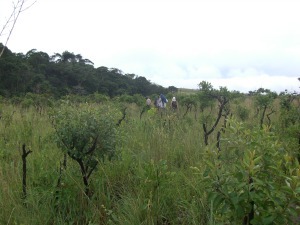 We also need to pay a lot of attention to the gradual change from the jungle of high trees to lower vegetation. After the two-hour hike, we will arrive at “Las Lajas”, where we will take a brief rest, since in the daytime, after a short permanence of people in this place, some tiny bees, although very annoying ones (especially for the eyes), start to arrive. After our hike towards the base of the mesa, the tough ascent to the top of the plateau starts. The difficulty of this will depend on the sunlight and heat at the moment of the ascent. In any case, it is necessary to have a good physical condition. Those who do not feel well to continue can stay in a small brook in this place, resting while waiting for an animal to come. 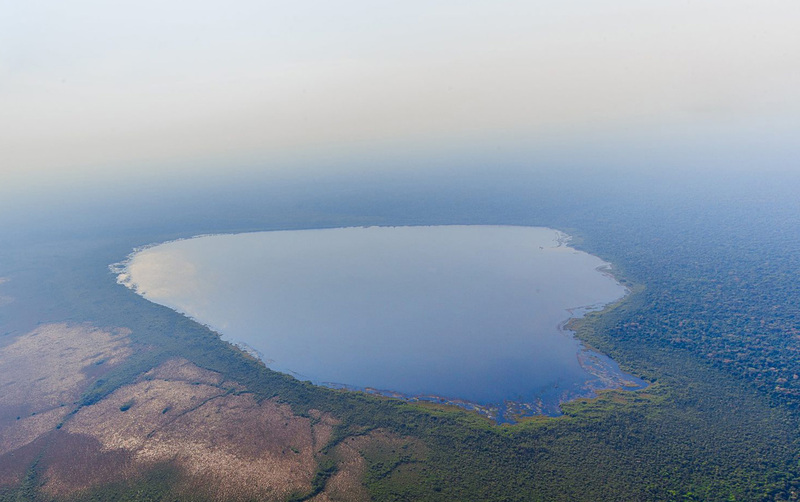 During the ascent to the top, the view of the jungle below in the prairie becomes wider, enabling us to see the famous and enormous “Chaplin” lake among the exuberant vegetation. It is also possible to observe birds such as the Macaws, flying below our level. 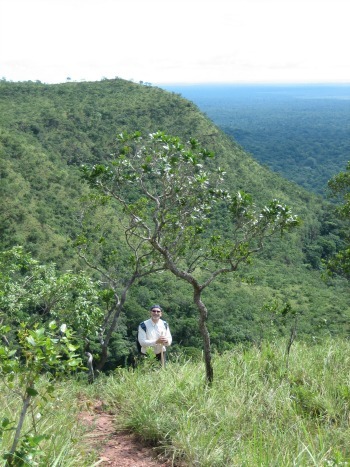 Once at the top of the plateau, we will have a one-hour hike enjoying the wavy green panorama spotted with virgin jungle, brooks and palm trees, and if we are lucky enough, we will be able to see some deer and/or Yellow-and-Blue Macaws (Ara ararauna). 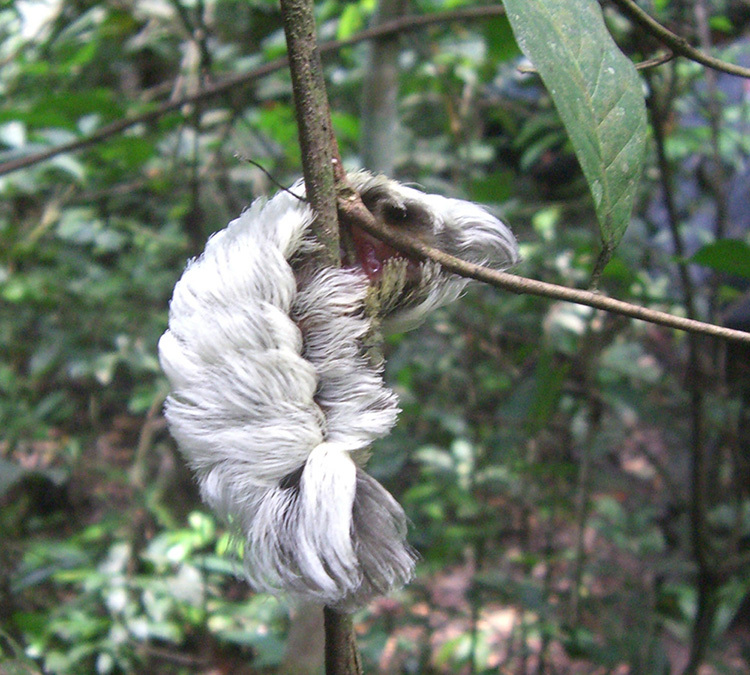 They nest in some palm trees located 30 minutes away from the trail that leads to the top of the plateau. After this experience, we will start our descent to the base of the plateau and to the vehicle. 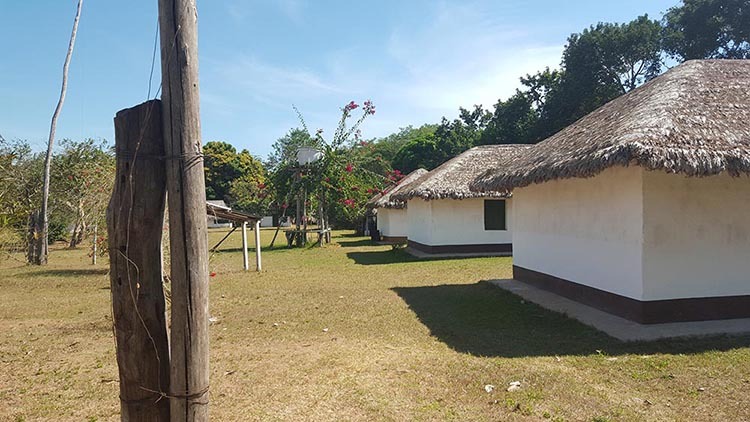 Depending on the unfolding of the program so far and the arrangements previously made in the offices of Amboró Tours in Santa Cruz…. 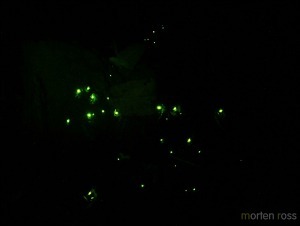 At night there is a possibility of a short nocturnal Safari with lanterns. Spend the night at the base of the mesa or at Los Fierros. In case we wake up near Los Fierros, we will leave at 05:00 on the vehicle with the spot- light in order to see some more of the wildlife in the Noel Kempff Park. We can also use this day to visit the El Encanto cascade, in case we did not have enough time to have visited it on the first day. This day is very necessary, if we are to climb the plateau in two days; that is, walking to the base of the plateau (Las Lajas) in the afternoon to spend the night there in tents, and early in the morning on the next day, hike to the top. The activities of this third day will depend on how fast the itinerary was performed in the previous two days. Depending on where we spend the night, the night of the third day can also be used to drive the vehicle with its halogen lights in the surroundings of Los Fierros, looking for animals. We can also use this night for a nocturnal hike with flashlights on open trails. 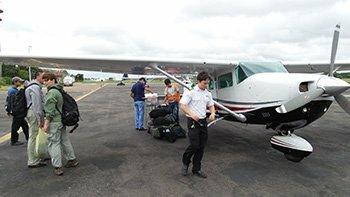 Very early in the morning, before sunrise and breakfast, we will take a short hike or go in the vehicle by the main path that leads to the Paraguá River. After lunch, we will leave this wonderful park in order to board the single-engine airplane that will fly us back to Santa Cruz, where a vehicle will be waiting for us to take us to our respective places. End of our Noel Kempf Tours service. Thanks. Early in the morning after breakfast we drive back on the same path that we came in, we drive towards the community of Florida or to some private ranch located along Paragua river. 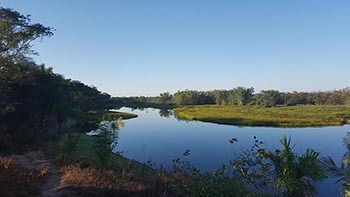 We will use either the community of Florida or a private property 1 hour away the community, along the Paragua river as a camp site to set up our canoe rides. After or before good breakfast with piranhas, we got one more time on the canoe to have another excursion on to the shores of the river or in some of its bays. During the early hour of the morning is possible to observe some birds like the Hoatzin, Greater anis, and many kinds of herons among other species. Some walks in forest of the park are also possible. 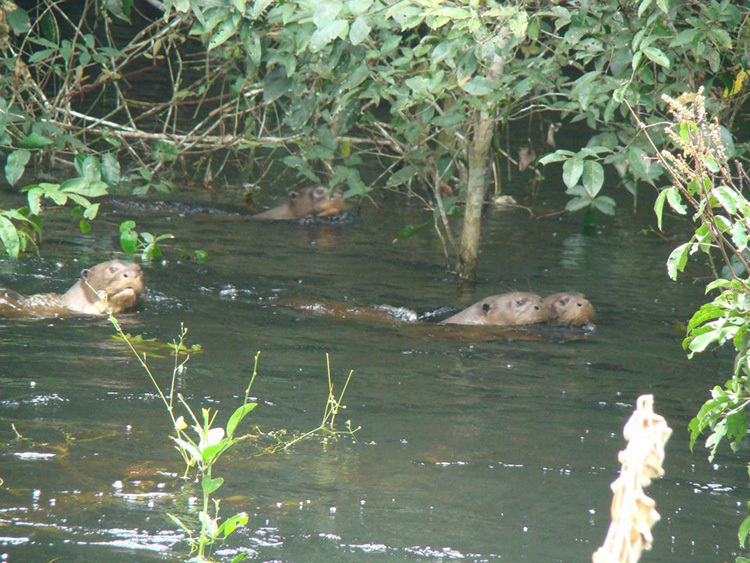 Mammals like the Giant River Otters are also quite common in this river. Remember that this itinerary can vary or not be fulfilled in its entirety by climate factors or the conditions of the roads and of the rivers or water streams. Also is our duty to inform you that during the Dry Season parts of the Plateau get on fire. The fire could expands kilometers according to the wind. This fire usually that not penetrates more that a few meters the jungle on the Plateau. At 09:00 hours we will start the first part of our trip to the park, aboard a private vehicle heading to the town of Santa Rosa de la Roca, located at 378 kilometers away (234.87 miles). This trip will be done on a paved road until the town of Concepción, passing by several towns and villages of migrants people from the high lands of Bolivia and Mennonites colonies. This trip is crossing an agricultural area, which grows soybean, sunflower, and several types of other grains. There, we can also realize the relentless advance of the agricultural frontier from 30 Kilometers (48.38 Miles) off Santa Cruz. After Concepcion the road to Santa Rosa de la Roca is unpaved for about two hours or 79 kilometers. The trip to Santa Rosa de la Roca takes approximately 6 hours. After leaving the City of Santa Cruz and in about 3 hours on the road we may stop in San Javier for 30 minutes. San Javier is a town on 542 meters on sea level. Most of its people have indigenous background. It was founded in the year 1691 by the Jesuits. Around 09:00 a.m. we will leave the town of Santa Rosa de la Roca, At the previous night the coordinator of tour would have confirmed to you the exact time of departure. 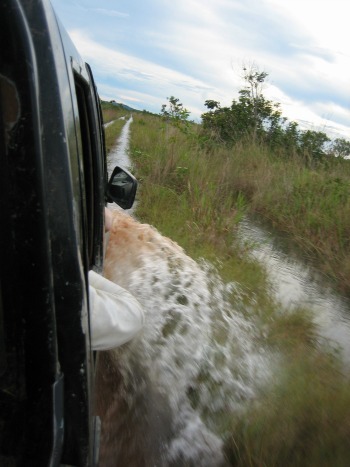 This trip will be in a 4x4 vehicle and will last approximately 6 (or more) hours until the community of Florida located on the border of Noel Kempff Mercado National Park. UNESCO declared this magnificent park as a patrimony of the humanity in the year 2000. During the raining season this road is in some parts very muddy sometimes it presents great difficulties to be transited by vehicles. Also we will also find fallen trees on the way or trailers trucks stuck in the mud of the road. We will stop on the way a few minutes for pictures or others reasons. But not longer than approximately 20 minutes, because we can fall prey to an amount of bees that becomes unbearable and of course the mosquitoes will be inevitable guests at night. As we approach the park, the vegetation becomes greener and the forests improve; therefore, the opportunities to encounter wild life also increase. Although the depredation by timber companies in areas of forest concessions is quite noticeable, with great grief for those of us who appreciate nature without human destruction. We will arrive at the village of Florida at the end of the day or in the evening. 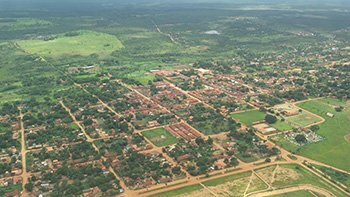 This village is a nice place surrounded by forest and by a oxbow lake of the Paragua River. It has nearly 20 families or less. 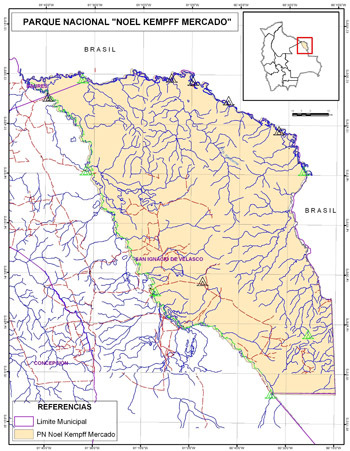 The population is decreasing due to the immigration of the youth people to San Ignacio or to Santa Cruz. About one year ago, the mayoralty of San Ignacio has provided a diesel engine for the generation of electricity, so this engine used to work almost every night approximately from 19:00 to 22:00. The service of pipe water at home is not yet installed. 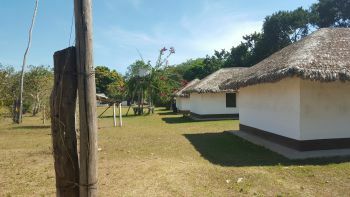 The huts that serve as lodging have palm or grass as roof. The lodgings places have toilet, but the water system does not work yet, so it is necessary use a bucket with water to flush toilets. The showers still does not work. But the oxbow lake next to the community although with some crocodiles, caimans and piranhas it is the place where people of the community wash their clothes and take a bath, so we can do the same. In Florida you may find brasilian and bolivian beer to buy, but it is very hard if not impossible to find some things from outside to eat or for personal use. Supper and spend the night in the village. After breakfast, we will visit the park ranger site to register our names. Later, we will head towards the crossing point to get on he other side of the Paragua river which is the natural border of the park. Some time ago we used to operate a big flat boat to get the vehicle across the river. Nowadays this flat boat is not working. So it is necessary to get something else to cross the river. Once on the other side of the river we will be inside the territory of Noel Kempff park. We will then continue our trip by foot or by motorcycles, On the path there are some wooden bridges in very bad conditions, although some or most of them were repaired in august 2009.
when we are walking on the bridges we have to be very care full with the broken parts of it. This trail with fallen trees blocking the way used to be the only road for vehicles that some years ago was opened. Nowadays the best is to enter the park on foot. 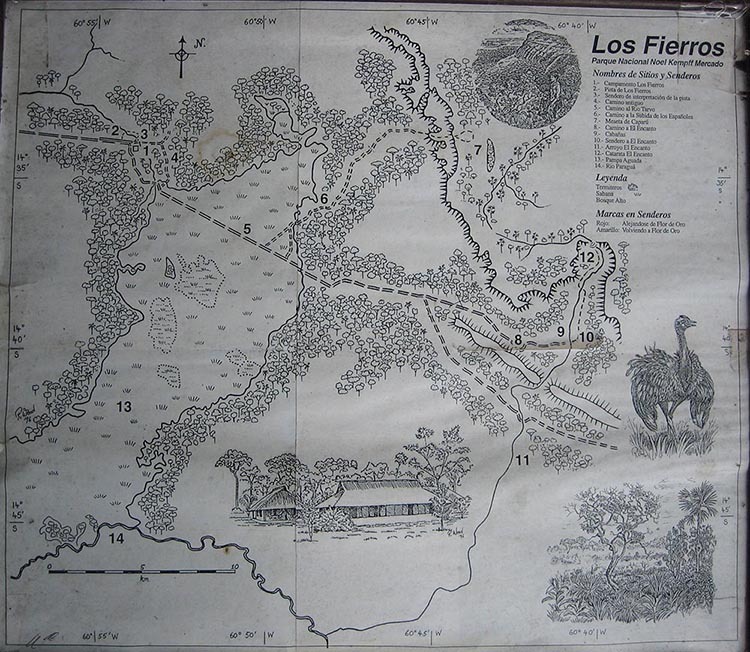 It is a long hiking from the border of the park to Los Fierros. Los Fierros cabins are some 35 kms away from the border of the park. 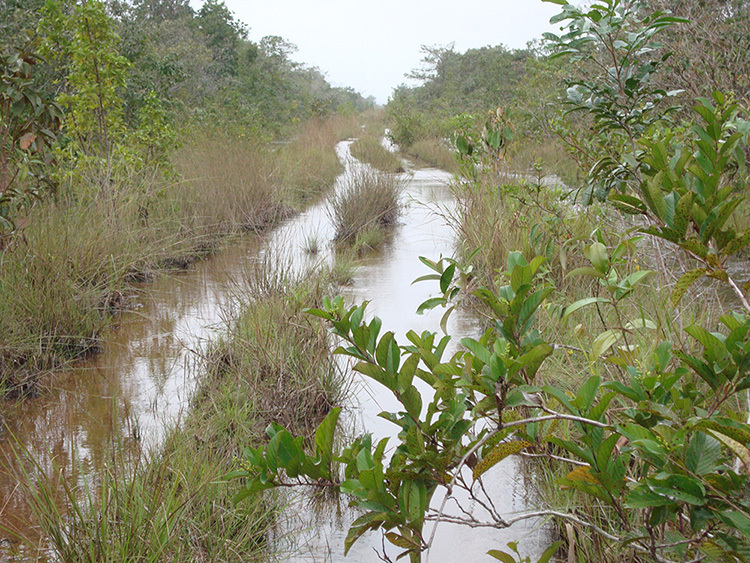 This roads is abandoned and the vegetation on both sides has closed the way in some parts. It was usual to see a jaguar or a puma, on this road they like to freshen up by lying on the way. The turkeys and macaws or “guacamayos” are other animals that we will have the opportunity to see in these paths through the park. About 2 kilometers before reaching Los Fierros Cabins we get to what used to be the airfield of Los Fierros. Amboro Tours used to clean up this airfield every year to have it operable. Once in the camping site of Los Fierros cabins we we should prepare or find a place where to set up the tents. 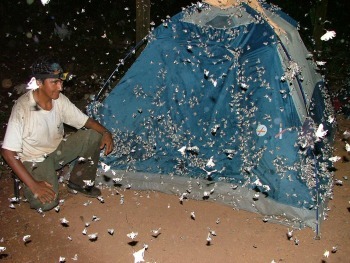 The cabins are useless, them are full of tiny ants that may get into your tents really easy depending on the the tent. Amboro Tours recommends to bring about half liter of diesel so you are able to set up your tent on the ceramic of the cabins. After breakfast we have to get ready to keep hiking or if we have a motorcycle we should get on the bikes to keep going on towards the Caparu (caparuch) Plateau. After the pampas the path gets us back into the forest for some times. Nowadays the last five or more kilometers of this path should be full of vegetation blocking it. This day we will get as far as we can on our way to Caparuch plateau. 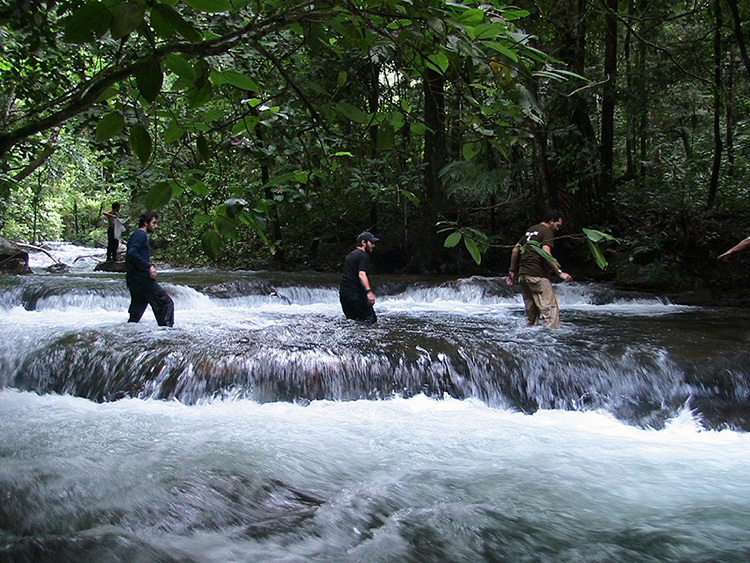 It is more likely that we would have to stay overnight by a stream Up to where the vehicles used to get. Close by this camping site and after a walk at night of about 30 minutes in the path and in the forest at night we can find this glowing termites during the months of October or November. 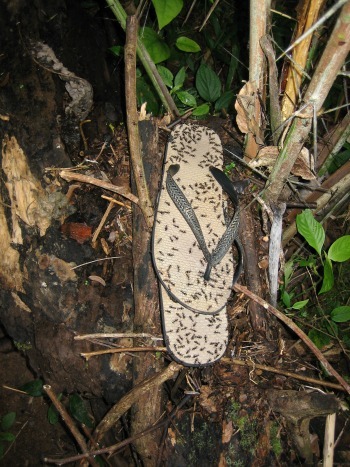 They do this to attract other insect. Assuming that we stay overnight by this stream. From this point it takes approximately 2 hours to hike to the base of the plateau. spotted with virgin forest, water streams and palm tree. on the way to this pool we will see a burned motorcycle and a short distance away we also can see parts of a small crashed airplane. 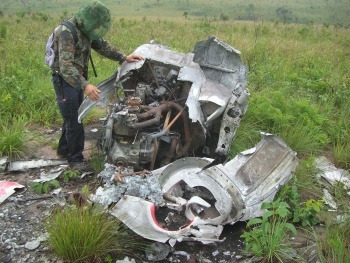 Both the motorcycle and the airplane used to belong to a drug factory installed in forest near by where still is possible to see some remains of it. 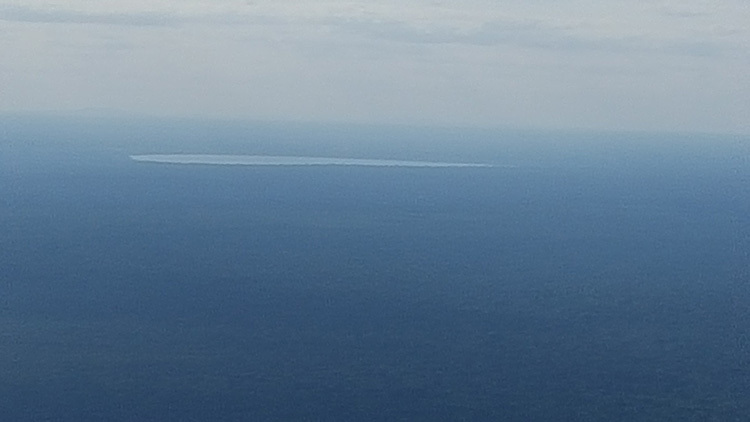 A well known bolivian conservationists named Noel Kempf Mercado was killed in the airfield of one of these factories on top of Caparuch plateau when his small plane landed with a team of nature researchers. It happened the 5th of September of 1986. Getting back on our itinerary and because this program does not include more days and after about one or one hour and a half on top of caparuch, we should return by the same footpath. On the way down hill we must take care of loosen stones. We arrive at Las Lajas and proceed towards Los Fierros. This way is entirely to hike to Los Fierros. 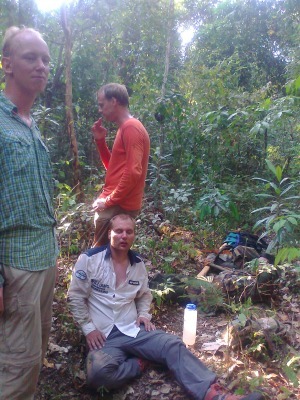 The hiking distance of today is approximately 20 kilometers. One in Los Fierros we can take a bath in the stream near by. Until the year 2010 (approximately) the road for vehicles to El Encanto Waterfall was open or was possible to get to the end of the road for vehicle with some difficulties. From Los Fierros it is about 25 kilometers El Encanato waterfall. At the end of the road for vehicles there used to be a small hut where we used to set up the tents. After breakfast in Los Fierros, we should start hiking to Florida Community. Florida is about 38 kilometers away from Los Fierros. After about 8 hours of driving we may get to a town called Concepcion. After breakfast we return to the ciy of Santa Cruz. It is here where this excursion with Amboró Tours finishes. End of our Noel Kempf Tours. 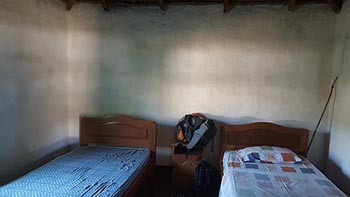 This trip will be done on a paved road until the village of Carmen de Ruiz located some 440 km from the city of Santa Cruz, passing by several towns and villages of migrants people from the high lands of Bolivia and Mennonites colonies. This trip is crossing an agricultural area, which grows soybean, sunflower, and several types of other grains. There, we can also realize the relentless advance of the agricultural frontier from 30 Kilometers (48.38 Miles) off Santa Cruz. After El Carmen De Ruiz the road to Campamento village is unpaved for about two hours. After breakfast we get ready to start the trip on a vehicle to Refugio Huanchaca. In dry season this trip could take about 4 hours. We may have lunch on the way or at Refugio Huanchaca. After breakfast we get ready to start moving towards Caparau Plateau. To reach the plateau could take 2 or more days, it depends on much we advance each day. If we are lucky the only car inside the park would take us some 3 or 4 hours down our route. If we ride the car it will drop off at the road that goes to Los Fierros. But we will walk towards Caparu plateau. From this point we start hiking today to reach a place called ‘’Arroyo II’’ It is going to be about 12 Kms of trekking on a old road closed in many parts by the fallen logs and vegetation growing on it. Most of this hiking time is going to be under the trees with big chances of encounter some monkey and luckily another mammals. From this point it takes approximately 2 hours to hike to the base of the plateau, arriving to a spot known as Las Lajas where we can find a small stream running down the rock. During this hike, we need to have our senses alert in order to listen to, smell or see interesting particularities of this jungle. We also need to pay attention to the gradual changes from forest of high trees to very low vegetation. Once we reach the base of the plateau, if it is hot or still it is not evening we should not be in this place longer than thirty minutes. The ideal time to arrive at this place known as “Las Lajas” is in the dusk, because during the day and with the presence of people, very annoying bees (especially for the eyes) begin to arrive at the place. But this time we are only resting in Las Lajas for about 20 minutes. As we climb the view of the forest of the park becomes wider and the immense “Chaplin” lake can be seen amidst the exuberant vegetation. 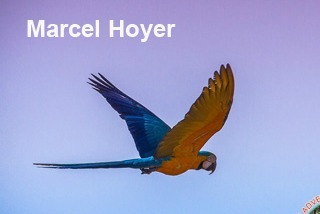 Likewise, depending on the time of ascent, we will have the opportunity to see the Blue-and-Yellow Macaw (Ara ararauna) sometimes they flying at a lower height from us. Once on top of the plateau, a short hike to a different edge nearby will let us appreciate different views of the green forest around us. On top of the plateau, we can appreciate the view of the waved green landscape spotted with virgin parts of jungle, a streams and palm trees. After a short rest we will keep hiking of about 1 1/2 hours to reach a camping spot, on the plateau, known as Huanchaca II. 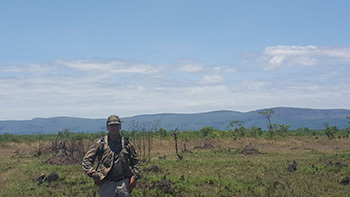 If we are lucky enough, we will be able to see dears, or even the macaws nesting in the palms that are about 30 minutes away from the edge of the plateau. Huanchaca II is a beautiful spot covered with a beautiful Amazon rain forest jungle. It is a place where Amboro Tours used to set up the tents next to a nice stream. At this place is possible to see monkeys and others mammals. 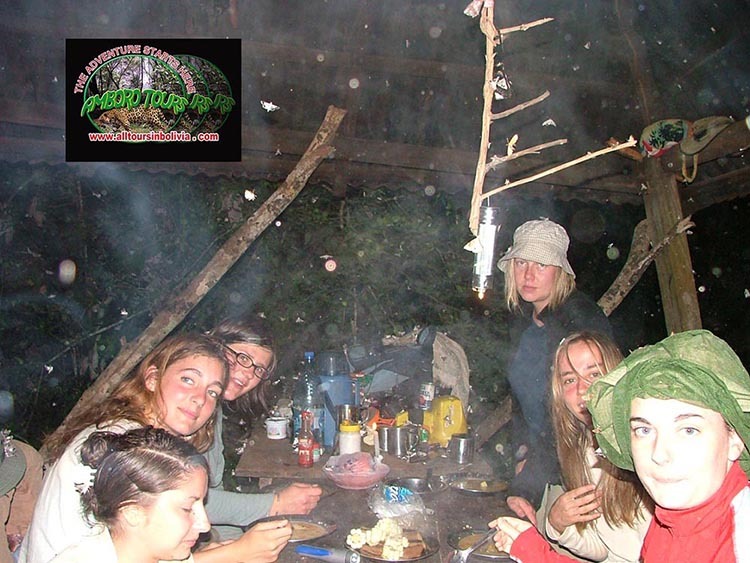 From Huanchaca II is possible to do some trekking in the pampas for about 40 minute to a beautiful natural pool. 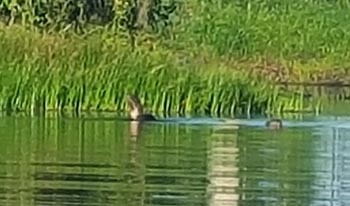 Although the last a group that was there did not get into the water because the presence of a big anaconda in the water. On the way to this pool, from Huanchaca II we will see a burned motorcycle and a short distance away we also can see parts of a small airplane crashed. 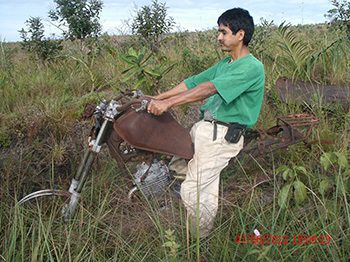 Both the motorcycle and the airplane were used to belong many yeares ago to a drug factory installed in forest nearby where still is possible to see some remains of it. After a nice bath in the clear water of this wild swimming pool we should go back to the camping site to cook lunch and to get ready for a afternoon hike in the virgin forest that surrounds us. 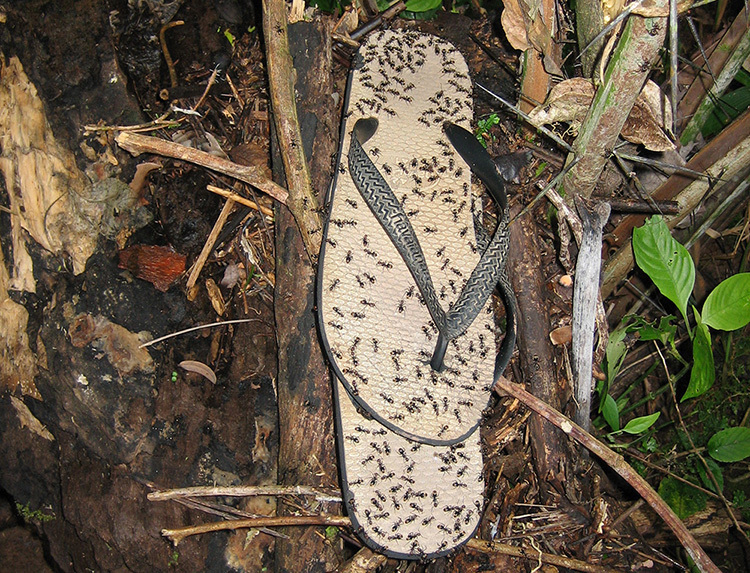 At night is also possible to have a short have to have more chances of observing some wild animals. 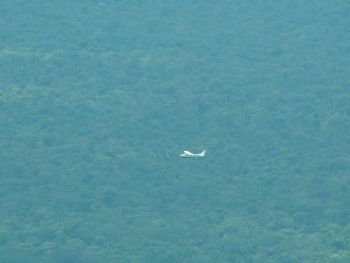 A well-known bolivian conservationists named Noel Kempf Mercado was killed in the airfield of one of these factories on top of Caparuch plateau when his small plane landed with a team of nature researchers. It happened the 5th of September of 1986. Besides of Noel kempf Mercado also were killed at the same time, Juan Cochamanidis, Franklin Parada Auclos. 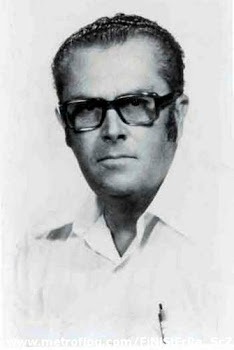 Vicente Castelló, a Spaniard scientist, was the only survivor. After a nice breakfast we should start the returning trip by the same footpath. Early in the morning is when we have more chances of seeing more birds and when the Ara araraunas macaws should be flying nearby. We also need to be aware that in dry season the pampas of the plateau get very dry and sometimes it gets on fire really fast. Once we get to the edge of the plateau we have to be careful on the way downhill we must take care of loosen stones. Very early in the morning we commence our last day of hiking towards Refugio Huanchaca. Once in the city we drive to your place. The best place in the world where it is still a pristine wildernessn is The Noel Kempff Mercado National Park is a must-visit for nature lovers and people who like to spot animals. 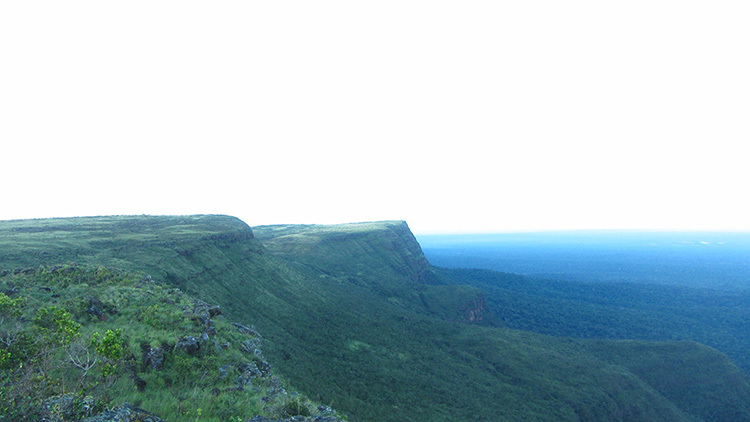 Due to the fact that the park is quite remote and it has become a protected area, there is a rich flora and fauna. Noel Kempff was added to the World Heritage List of UNESCO in 2000. This thanks to the park to the different habitat types ranging from savannah and forest to the Amazon forest on the plateau. Different rivers originate in the park and form spectacular waterfalls. An estimated 4000 species of flora, more than 620 species of birds, more than 130 species of species, including globally endangered animals, live in the park. In the Noel Kempff National Park live moonswolves, jaguars, giant river otters, tapirs, giant armadillos. And the 20% of South America's bird species can be found here, including 9 species of aras, the highest number of species in a protected area. In addition, there are 37 species of reptiles, including the black Cayman and 347 insects, many of which are among the most rare in the world. What To Bring to Noel Kempf Tours ? 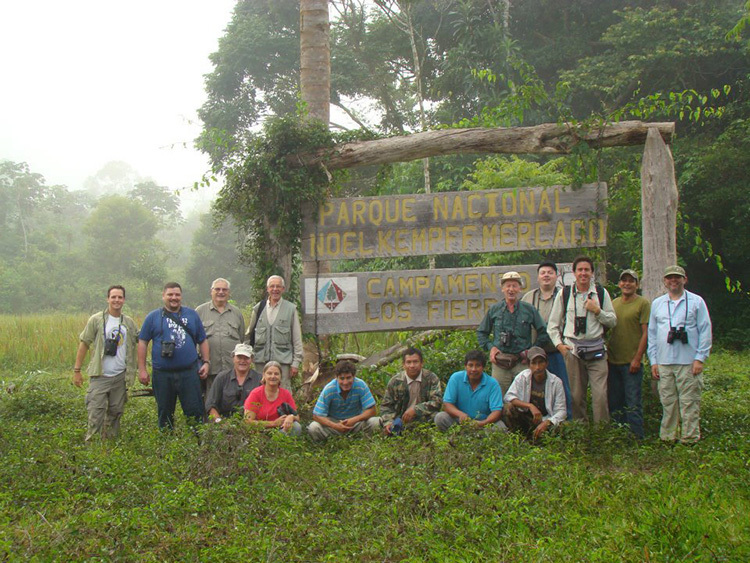 The Estacion Biologica El Refugio (14'45 S, 61' 00 W) is a 50,000 ha reserve adjacent to and partially overlapping the Parque Nacional Noel Kempff Mercado in northeastern Bolivia. 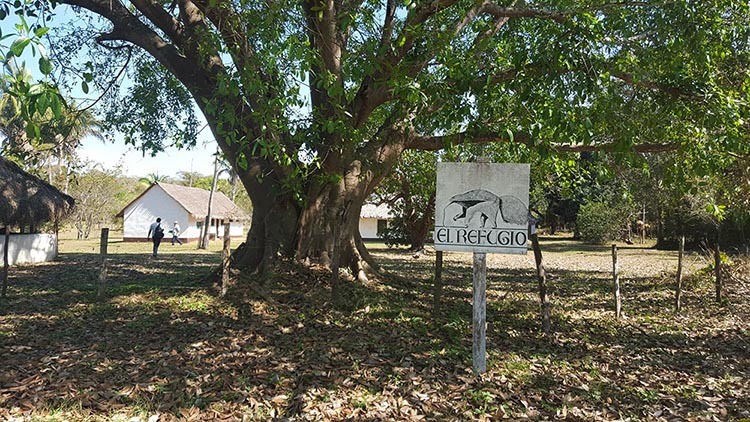 El Refugio is located in a climatic and biogeographic transition zone between the moist Amazonian forests and dry forests and grasslands characteristic of the Cerrado and Chaco. 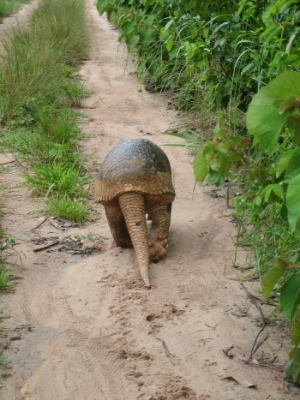 There is relatively easy access to many different habitat types from the main camp, located along the banks of the Río Paraguá. 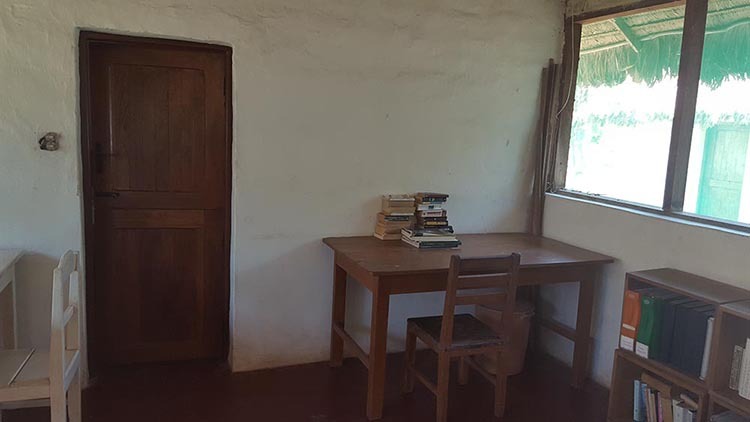 El Refugio is a small station capable of housing a maximum of eight scientists at a time. 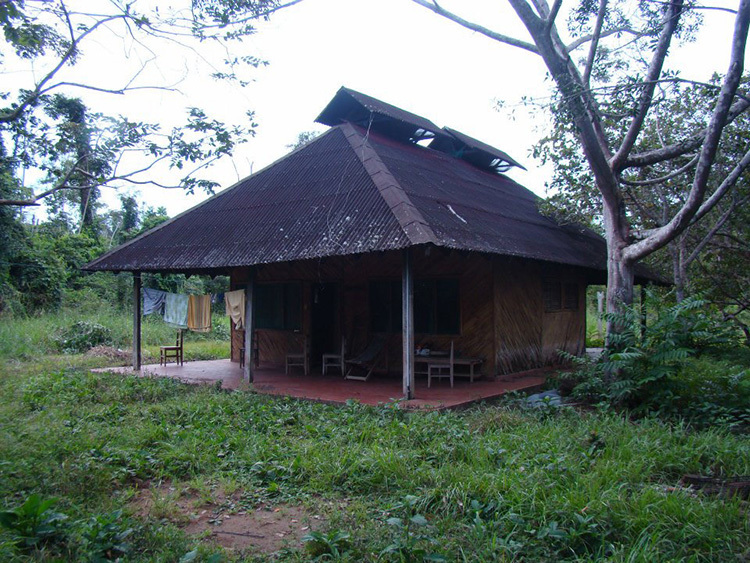 To learn more about El Refugio or Noel Kempf Tours and research possibilities at the site, please visit the links below.